CardLogix helps you complete your smart card solution with a wide range of fulfillment services. We can help you make your card program a success through Custom Packaging, Collateral Production, Mailing and Intelligent Insertion, and Variable Data Imaging. Cards can be shipped in a wide variety of options. Our standard packaging is 500 cards per box sleeve with tamper evident tape. A bar-coded label further identifies these smaller boxes before they are shipped in 4, 6, or 8 sleeves per carton. All cards are counted with a Spartanics Visa-approved electronic card counter and is the world’s only counting systems that double scans actual cards twice. Outer cartons are marked with an additional barcode label for easy shipping. We can also shrink wrap in bundles of 100 or put cards in individual polybag packaging, per customer specifications. In addition to these options your program may benefit from the collateral choices shown below. These carriers allow for additional text and graphics that help explain how to use the card/program and promote the program itself. 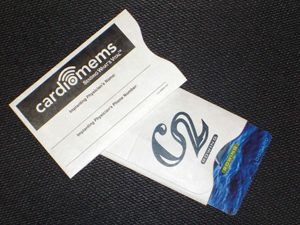 Card sleeves are available in top-loading and side-loading styles. These sleeves are available in numerous designs, including Wallet, Passport, themed (Barbie, secret agent, etc. ), in additional to more general designs meant for informational applications (e.g. bus and train schedules). They can have up to 28 pages for content, giving you ample room for program tie-ins, such as advertising retailers, concert tour dates, and participating partner vendors. For mailing and distribution, the card(s) can be mounted on a literature piece or ‘carrier’. These are available with two types of folding and can be pre-printed with matching variable data. We’ll customize your card and carrier with personalized messages or recipient names. Printing choices include laser, thermal, and inkjet in simplex or duplex modes. Connect with your customers with the power of interactive messages. The CDplus ConnectCard is the perfect way to attract more customers and increase your sales and ARPU. This wallet-sized mated card melds the powerful communication utility of optical media with the functionality and versatility of any Smart Card or SIM Card. The CDplus portion of the card holds more than 14 MB of uncompressed data and is currently available in CD-ROM format, with CD-R and DVD-ROM soon to follow. The patented CDplus ConnectCard is the next generation plastic card. Its applications are only limited by your imagination. The CDplus ConnectCard will leave your customers with a lasting impression. Dazzle them with a card no larger than a credit card that delivers dynamic information. Show them videos of new applications that they can purchase. Give them a Flash presentation of customer service related topics. And cross-sell to media events, movie theaters, or even food service. Retail and promotional collateral often distributed in blister packing. Clear plastic blister covers seal printed material and cards securely against a cardboard back, keeping everything clean and protected. An optional punch-out window is available for use with SKU numbers or barcodes for activation and inventory control purposes (please contact us for more information regarding card activation recommendations). We offer a variety of options that fit your business, including multiple page collation and selective insertion. Also offered are OMR, barcode, and postal sorting capabilities.